Socket Fusion x Female FPT Brass Threaded Transition Fitting, Black PE100 Resin, 230psi Rating, For Use with DR11 or Thicker Hdpe Pipe up to rated pressure capacity. 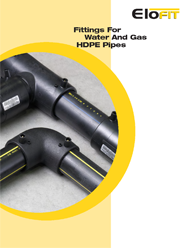 Compatible with PE3408, PE3608, PE4710, and PE2406 Hdpe Pipe. Click the button below to add the Socket Fusion x Brass Threaded Transition 3/4" IPS x 3/4" FPT to your wish list.